Bridesmaid Glamorous Jewelry in Swarovski Aquamarine Crystals Double stranded necklace with stud dangling surgical post earrings & matching double stranded stunning bracelet. 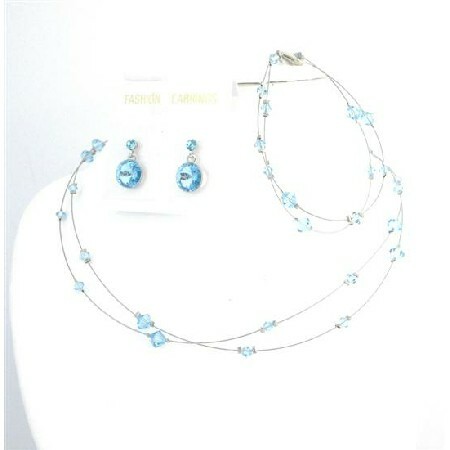 Bridesmaid Glamorous Jewelry in Swarovski Aquamarine Crystals Double stranded necklace with stud dangling surgical post earrings & matching double stranded stunning bracelet. Customize your wedding party & bridesmaid jewelry in any color they are hand-matched & hand strung the Necklace Earrings & bracelet is the ultimate layering piece or bold & beautiful on its own you must-have & make your dream comes true.